Recently we have seen an increase in female Muslim athletes in the media, particularly those who wear the hijab. This is an attempt on their part to break the stereotypes about Muslim women and encourage other Muslim women to participate in the sports they love. The mainstream media has always represented Muslim women as oppressed and therefore unable to freely make life decisions. Why not take a look at the opposite side of the story? 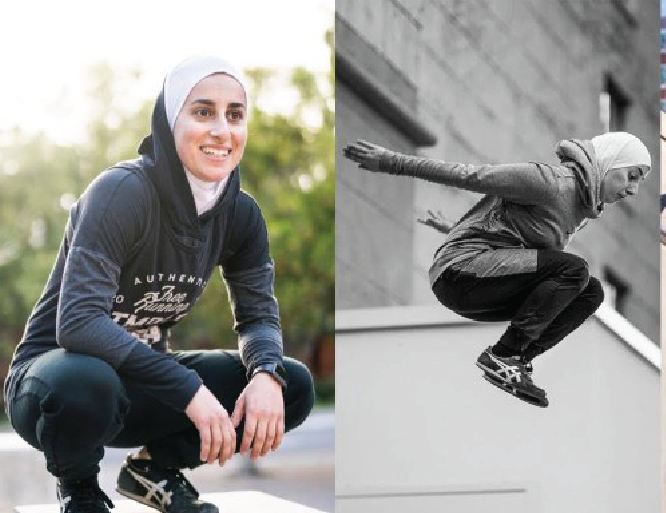 Sara Mudallal is a 22-year-old parkour athlete. To her, wearing a hijab isn’t an obstacle. It’s her pride. She started her training sessions two years ago and already excels in the sport. Parkour is a sport which involves getting from one point to another as swiftly as possible no matter how difficult the terrain is. It involves constant body movement, with running, jumping, rolling, vaulting, swinging, and so on. It is basically a training discipline that has developed from military obstacle course training. Parkour’s development from military training gives it some aspects of a non-combative martial art. Sara is aware of the fact that she’s had to overcome many obstacles. First of all there are few girls in this field. Being a girl doing a guys’ sport she considers herself a “minority within a minority”. This hasn’t deterred her confidence in any way and she is all the more determined. Her bigger goal is to inspire women. The trend of breaking stereotypes has set in and is being taken up by many women. In February, Nike launched a promo ad for Nike Middle East where we see women playing soccer, boxing, running, ice skating, fencing, and riding motorbikes. Girls like Sara are empowering Muslim women to pursue what they love irrespective of societal pressures. We salute her great effort.